Well-equipped skating backpack in durable, water resistant G-1000 Original with waterproof pack bag. Many well thought-out functions and safety details make it the perfect choice for long-distance skating, and the detachable skating details mean that it can also be used for other outdoor activities. Safety details include a lifeline extension strap that attaches to the shoulder straps with push buttons and offers quick access to the lifeline. There is also a crotch strap that attaches to the bottom of the backpack and two buckles on the hip belt. The crotch strap can be removed or stored out of the way in one of the pole attachments if the backpack will be used for a different activity. A detachable, waterproof pack bag holds a dry change of clothes in the event of an unexpected swim. The pack bag also floats and its yellow colouring make it easy to find things packed inside. If you need to attract attention, there is a small whistle integrated into the buckle of the chest strap. The main compartment is top-loading and has a roll top. 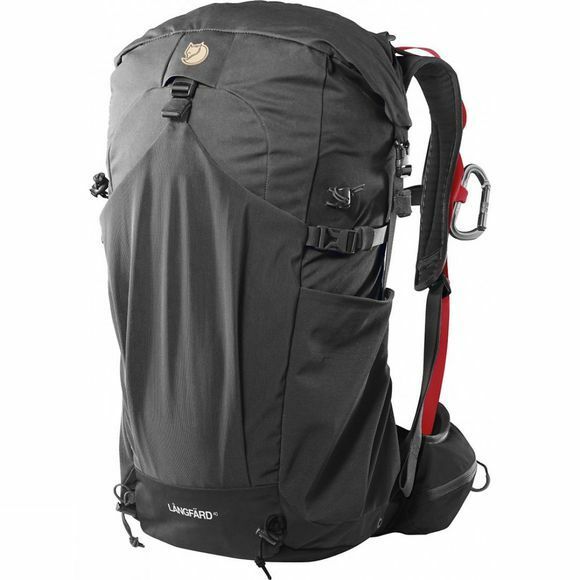 On the outside of the bag there are attachments for telescopic poles, two mesh side pockets with room for a lifeline and a large front pocket that can hold, for example, reinforcement garments. The backpack also comes with a separate bag for the skates to protect both the skates during transport and the bag from sharp blades. The support system has a comfortable back panel made from snow and water resistant G-1000. The hip belt buckle is placed asymmetrically on the left, which means there are fewer details in the middle front that can get caught if you need to be dragged out of a hole in the ice. The hip belt also has two easily accessible pockets for snacks and small items.